The Ultimate Guide to Essential Oils for Stress - That Actually Work! Inside: Struggling with the challenges of everyday life? Check out these powerful essential oils for stress. Plus, learn several essential oils for sleep, anxious feelings from everyday life and nervous tension. The stress of everyday life was getting to me. I’d go into the bathroom for a moment to get my breath, trying to somehow compose myself. Falling into the trap of having a tantrum myself – as the parent – was a lot harder than I thought. There’s this deep pressure to do it all – they call it the invisible load. It’s knowing what everyone likes, deciding what holiday cards to send, having a mental inventory of what’s already been cleaned this month, knowing the yard work that’s piling up, picking up the birthday gift for grandma, and knowing which night you won’t be home for dinner because of volunteering. And it’s putting away the toilet paper and paper towel and making a mental note of when it needs to be replaced. It’s noticing that teriyaki sauce has spilled in the back of the fridge and silently cleaning it up. It carries over into birthday parties and teacher gifts and school forms and remembering to mail a baby gift for your new niece. The re-stocking of toilet paper in between completing that work presentation or college paper in the late evening hours. It’s looking for the lost wonder woman sneaker for twenty minutes while your three year-old sobs on the floor like a fish out of water. Annnnddd…You’re only a gazillion minutes late for meeting your friend for dinner on Thursday night. 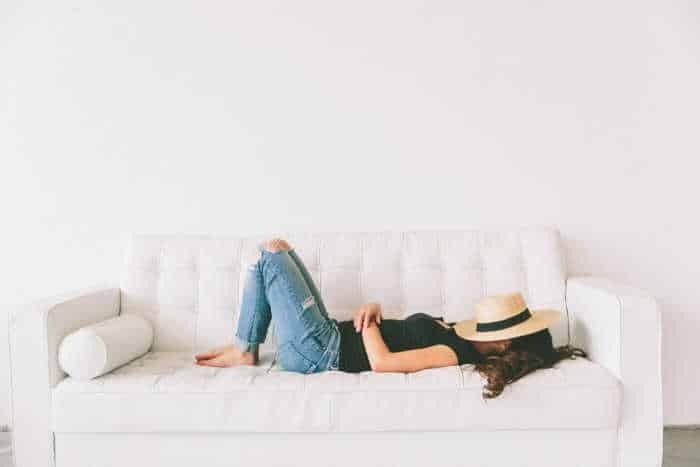 You are downright overwhelmed and exhausted and no one is talking about it. I sat there in the bathroom – triggered. Yes, that’s the word – triggered. I wasn’t depressed or unhappy per se. I was triggered by the throws of everyday life. At any given moment my skin was crawling. I knew there had to be a better way to get a handle on my stress and emotions besides “thinking happy thoughts” or “staying positive.” That’s what all the gurus love to say, as if it’s a magical fix to stop feeling triggered all the time. This is the main reason I started researching what essential oils could do to support my emotional wellness. I wanted essential oils for stress and I needed them all yesterday. Here’s a little geeky essential oil science for you. The scent of an essential oil can directly effect everything from your emotional state to your lifespan. When a scent is inhaled, the airborne odor molecules travel up the nostrils to the olfactory bulb, which receives the information and transmits it to the limbic system (inside the amygdala) where emotional memories are stored. Because the limbic system is directly connected to the parts of the brain that control heart rate, blood pressure, breathing, memory, stress levels and hormone balance, essential oils can profoundly support your body both physiologically and psychologically. The sense of smell is the only one of the five senses directly linked to the limbic lobe of the brain, the emotional control center. Anger, depression, fear, anger, and joy all come from this region. 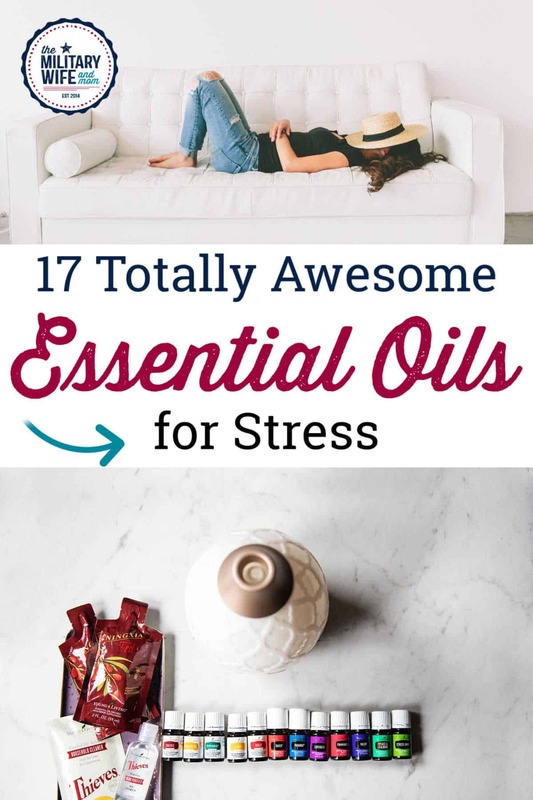 17 essential oils for stress that you’ll love. This makes essential oils one of best ways to support your body’s natural response to stress and emotions. I love to start with one of the most well-know essential oils for stress – the swiss army knife of oils – lavender. Calming, relaxing, balancing both physically and emotionally. Lavender has been documented to support concentration and mental fitness. My favorite part about this oil is it’s very affordable and it smells intoxicating. Not all oils have a appealing scent. PLUS, this oil comes in the young living starter kit which is how I got started with using essential oils. A little fresh start in the a.m. is always in order, and this is another oil you’ll find in the starter kit. When I’m more alert and awake, I feel equipped to handle the challenges of everyday life. It’s also highly regarded for supporting focus. The more productive I am, the more I tend to keep my day organized and streamlined. My favorite way to use peppermint is to diffuse and to put a drop on my thumb and then press into the roof of my mouth (use peppermint vitality for this). Adored for its clean, fresh scent, lemon essential oil is shown to uplift emotions and calm anxious feelings from everyday life. Supports memory and relaxation – a powerful, and often overlooked, essential oil for stress…and comes inside the kit. This is a gentle, fragrant blend that brings a feeling of peace and tranquility to both kids and grown ups. Perfect for relieving daily stress and nervous tension. Comes inside the Young Living premium starter kit. It helps with normal, everyday stress, improves mental response, restores balance, promotes relaxation and helps support a healthy blood pressure. It also smells delightful and can easily be worn as a replacement to commercial perfumes, which are well-known to contain toxic synthetics and endocrine disruptors. This blend was specifically formulated to balance energies and instill courage, confidence and self-esteem. It helps the body self-correct it’s balance and alignment. We use this oil everyday in the home and it’s especially useful when you’re dealing with anxious feelings related to daily life challenges. 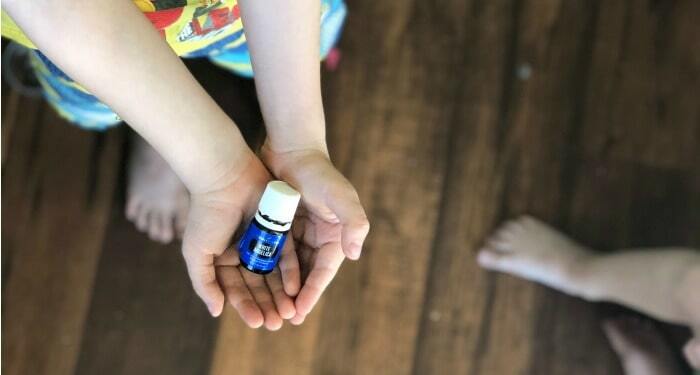 My kids love this oil before school. Comes inside the starter kit when you get your own Young Living account. Help promote relaxation and a deep sense of peace and emotional well-being with this essential oil for stress. It helps to dampen tensions and uplift spirits. When you massage it to the bottoms of you feet, it helps you settle into a peaceful nights sleep. It can also calm excited or hard-to-manage kiddos. So grateful for this oil. This one now comes inside the 2019 starter kit. Yes, really! This essential oil was well known during the time of Christ for it’s anointing and healing powers and was one of the gifts given to Christ at His birth. Frankincense was valued more than gold during ancient times, and only those with great wealth and abundance possessed it. Frankincense is coveted for increasing spiritual awareness, promoting meditation, supporting a positive attitude and uplifting emotions. I like to put a drop on the back of the neck to help ground emotions. When you get started with essential oils, this comes inside your kit too. You’ll love how this blend produces a magnetic energy that brings joy to heart, mind and soul. It inspires romance and helps overcome deep-seated grief and negative emotions. This is a helpful blend to release anger and memory upsets from the liver in order to create emotional well-being. It helps open the subconscious mind through pineal stimulation to release deep-seated emotions. It’s one of the most powerful of the emotionally supporting essential oil blends. It’s also included in the Feelings Kit. I saved for this one a long time, and it was so worth it. When struggling with that “triggered feeling” throughout the day, I will put a drop behind each ear lobe, a drop to the back of my neck and then inhale or diffuse. Magical! If you experienced challenges in your childhood, you can become disconnected from your inner child, which causes confusion. This blend helps stimulate your memory response and helps you to reconnect with your inner self or identity. It’s one of the first steps to finding emotional balance…and also included in the feelings kit. This unique blend contains lavender, cedarwood and roman chamomile in a roll-on applicator – which provides portable relaxation and stress relief. Haha, I love it. The portable relaxation always makes me giggle, but it’s also so true! I often put it on right before a bath. All three of the oils in this blend have been well documented for effectively reducing restlessness and inducing a calming feeling to the mind and body. The combined effect is uplifting and can be useful in promoting sleep too. If you want to promote emotional wellness, this is your blend. Harmony creates a balance of the energy centers of the body. It brings you into harmony with all things, people and cycles of life. It is also helpful for amplifying well-being and dissipating feelings of discord. You’ll find this oil in the feelings kit too. This blend stimulates emotional centers of the brain, awakening creative thoughts and enhancing dreams and visualizations. It smells divinely yummy when you take a whiff from the bottle. Protect yourself from negative thoughts and dreams that might cloud your vision with this one. For centuries, mothers have used chamomile to calm crying children. Use this one for stress, sleep, restlessness, and promoting positive feelings. This blend helps release hurt feelings and negative emotions. It also helps release negative memories, allowing you to move past emotional barriers and attain higher awareness. Forgive and let go. Also comes in the feelings kit. Ever desire to enjoy life in the moment again? This blend empowers you to do exactly that. Disease develops when you live in the past and with regret. Being in the present time is key to progressing and moving forward. Present time comes in the Feelings Kit. The number one goal of this blend was to help stimulate euphoric emotions. Smelling this cheerful aroma to boost self-confidence and encourage your mind to enjoy life’s simple pleasures. Those were a lot of essential oils for stress AND I didn’t even cover all the options you have to choose from with YL. So where do you start with oils? Well, for starters, who and where you order from does matter. It seems like a new essential oil company is popping up every other week nowadays. Today approximately 300 essential oils are distilled or extracted worldwide. Ninety-eight percent of the essential oil volume produced today is used in the perfume and cosmetic industry because only 2 percent of the production actually meets standards for therapeutic properties and benefits. You do not want to find yourself buying perfume grade oils that are falsely labeled as therapeutic grade (more on that in a sec). You can have pure oils, but if the plants are distilled at the wrong time of day or with incorrect distillation procedures, the constituents that make the oils therapeutic will not be there. Young Living is the only company that is directly in charge of ALL essential oil farming operations. Every other company I researched goes through some kind of an “oil broker” to buy their oils. When you invest in essential oils for stress, you want them to work. 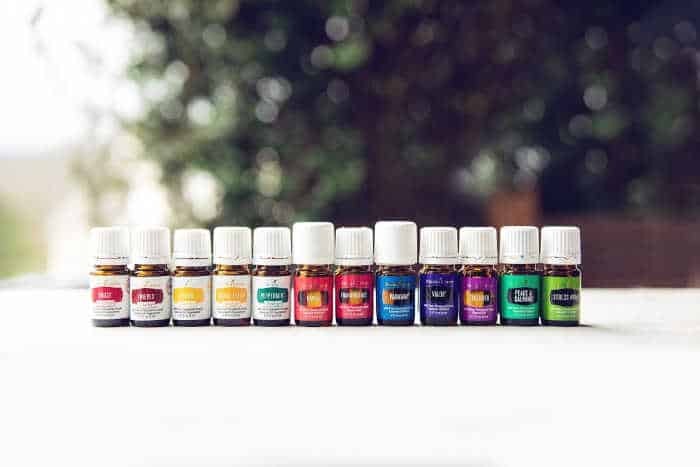 Today much of the essential oils sold around the world are adulterated, which means synthetics are added to the “essential oil” to make it stretch. Most people don’t know the difference and are happy to buy it…until of course they realize that there are no therapeutic benefits to using synthetics. Since the essential oil industry isn’t regulated, someone can label a bottle as 100% therapeutic grade and it can contain less than 5% essential oil. Buying less expensive oils usually means you’re applying synthetics, not therapeutic grade oils onto your body. 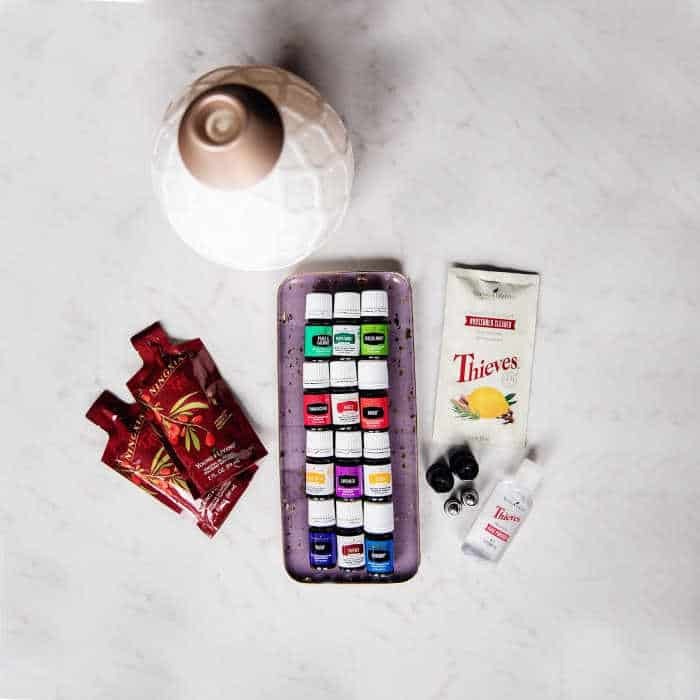 If you’re looking to get started with essential oils for stress and you aren’t a Young Living member, you can learn about creating your own account here. If you have a close friend or family member who does Young Living as a business, you can sign up with them. Just ask them for their referral link and you’ll be off to the races. If you don’t have a person that is actively teaching classes and supporting their YL members, I’d be honored to help you. There’s always room at the table here, and we love to offer lots of extra goodies to our members. Learn more about that here. How to use essential oils for stress? One final question you may be asking is how exactly do I use all the oils you mentioned above? There are three ways to use essential oils: Diffusion, topical and dietary. When trying to support your emotions with essential oils, your best options are diffusing / aromatic or topical. Essential oil blends that are meant for stress are not typically ones you’d ingest. Diffusing essential oils for stress. First smell them directly from the bottle. This helps get your brain ready to receive the oil. Just like Pavlov’s dogs, you can train your brain to start relaxing at just the whiff of the bottle. Then put 6-10 drops into your diffuser and run throughout the day. If you have a essential oil book that tells you to only diffuse for one hour, three times a day, this is usually in reference to atomizing diffusers that pump out straight essential oil. They typically are not referring to a water-based diffuser like the dessert mist or aria that come inside your Young Living kit. Topical application of essential oils for stress. As a general rule, when applying oils to yourself or another person for the first time, do not apply more than two single oils or blends at one time. Again, smell the bottle first before applying it to your body. Many oils are safe to apply to the skin without being diluted, however, you must be sure the oil you are using is not adulterated. If you’re using YL, you can be sure. When applying essential oils to yourself, use 1-2 drops of an oil on 2-3 locations 2 times a day. Increase to 4 times a day if needed. When trying to support your emotional wellness and decrease stress, you’ll need to consistently use oils throughout the day, every day. Stop feeling overwhelmed with everyday life. Years ago before I was consistently using essential oils for stress, I’d hide in the bathroom trying to cope and catch a breath while my kids were screaming like banshees in the living room. And of course, it’s not that I don’t feel the pressures or stresses of life anymore, but now, I do have the tools to help me rediscover peace, balance and greater happiness. If you’re interested in getting started with essential oils, check out our monthly flash sale here. Want more on essential oils?